A couple of articles have appeared in print magazines this year related to these trips in AUKLET. Each has been reprinted in another publication (including with a photo on the cover, for one!) and as a result the articles are presently both available electronically as well as in the print editions of the magazines. There was a fun letter to the editor that just appeared in one of those print magazines, the November 2013 issue of Messing about in Boats, and with the publisher’s permission I am copying that letter here. Following, I’ll add the links to the electronic versions of the articles and where they can be found on actual paper. When I saw that dumpy looking boat on the September cover I thought, here we go again! After reading about its skipper I then thought, quite a lady, made her coastal cruise seem like a trip around the harbor. Hats off to her. Most guys would write about aches and pains and DANGER. She was relaxed, made it look like child’s play. The boat fascinated me. 19′. You owe your readers a page showing Bolger’s plan, making a silk purse out of what looks like a mishmash. I do feel compelled to respond to the part of the letter referring to “that dumpy looking boat … looks like a mishmash.” I take full responsibility for the mishmash part of that – I think he’s really referring to the rig. The mizzen mast and sail are as designed by Phil Bolger, but the mainmast and mainsail are not. The mainmast is short, and the sail is the design for Paradox, done by Matt Layden for that boat. This is explained in the article. Further, the two sail colors are my responsibility, but there is a reason! Tanbark sails are much more visible, during daylight, than white sails are, especially when the boat is out at sea and surrounded by whitecaps. But then in the dark, you want some white sail area so that, in addition to navigation lights, you can shine a strong light on the sail and make sure that surrounding traffic is noticing your tiny boat. Aesthetically I would love to have both sails tanbark – but every time I’m out at night and there is traffic approaching, I bless that white sail as I’m shining the floodlight on it. 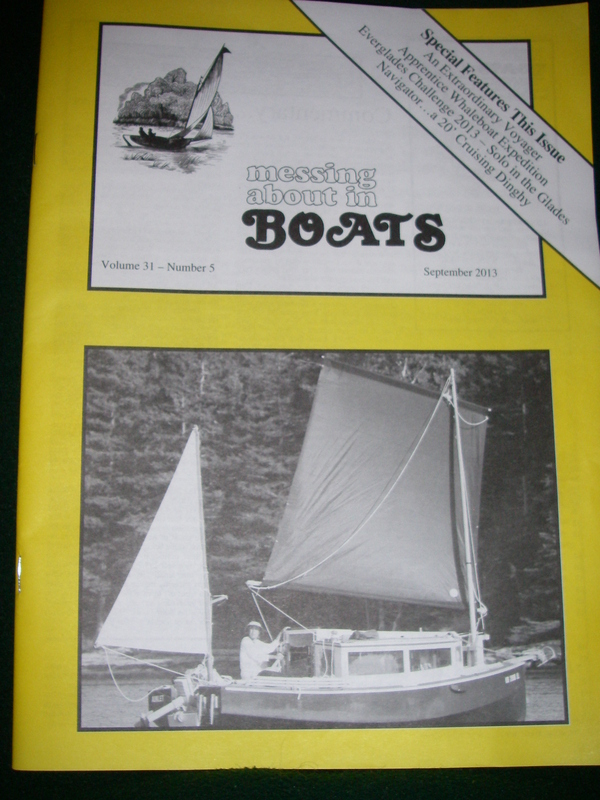 This same article was reprinted under the title “An Extraordinary Voyager” by W. R. Cheney (with cover photo by W. R. Cheney) in the September 2013 issue of Messing about in Boats. Both of those articles are about the trip in 2012. Word has it that there will be a bit of an article about the 2013 trip appearing in an upcoming issue of MAIB. Messing about in Boats is a monthly print magazine published by Bob Hicks, with information available at: http://www.messingaboutinboats.com or by contacting Jane Hicks at: maib.office@gmail.com. As these things go, MAIB has a small circulation, but its readers are devoted. Up and down the coast I met individuals who were familiar with AUKLET as a result of this publication. If you haven’t seen it, you’re missing a treasure!